Let the icy grip plunge me under… Until the chrysalis is completely shed and washed away forever. Even now. As the cold challenges me. Frigid fingers jab me and push me. It is a bitter cold that demands movement for warmth. Stay still and let the cold freeze you to death, or move and live. Move I do. After coming up fully clean I cannot allow these others to remain dry and empty standing catatonic in the midst of their hope. The injustice fills me with rage. They must be reached. They must be awakened. They must be filled with the river. With the water they long for and need all around them, I cannot allow them to perish in their desiccated state. Fueled by cold and anger I move. For the first time in my memory, my feet dislodge from their posts where they have stood sentry for days untold. Each rising from the river bottom, a task as difficult as raising the twin pillars of Hercules. It takes a moment to liberate them from their aquatic mausoleum. As they are freed they find new life. They propel me forward, toward the nearest of the thirsting throng. There is no subtility in my approach. As I travel I flail. I splash. I thrash. I am moving. The water is moving. The river is being thrown into the air around me as I close the gap between this man and the life he needs. The man, though, is oblivious to me. The water touches him before I come within arm’s reach of him. 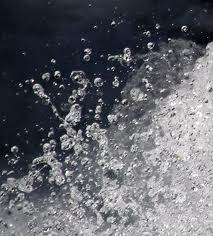 Drops of river spray cover his head, hit his face, wet his hair but neither affects his stare nor revives his vitality. I take a step back and lower myself until my shoulders are under the surface. Then I launch myself out of the water, fully spraying the man – covering him head to knee with the river, with what he needs. His reaction is not what I expected. He does not leap for joy. There is no great awakening. He does, however, grab fistfuls of my shirt and pull me close to him for a brief second. In that second he tells me to leave his world alone and then thrusts me back into the river. Having lost balance and control the river carries me. I come to rest not too far from an older lady. She is wrinkled, has a head covered with thin, grey strands of hair, and is wearing a bright flower print mumu that is two sizes too large for her aged frame. Her face, arms, and dress are spotted with grime. She is standing firm in her place, unmovable as the rest, yet her eyes hold a bit of life in them. She sees me and smiles.